Beautifully engraved RARE SPECIMEN certificate from the Southern Telegraph Company dated 1882. 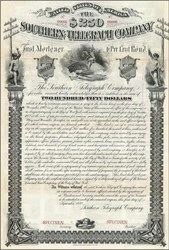 This historic document was printed by the American Banknote Company and has an ornate border around it with a vignette churbs holding tourches near telegraph poles on both sides. Mercury touches key sending message around the world. Minor fold split. VF+. This item is over 122 years old. This is the first time we have had this for sale.